I’m always looking for great dinner ideas with ground beef. 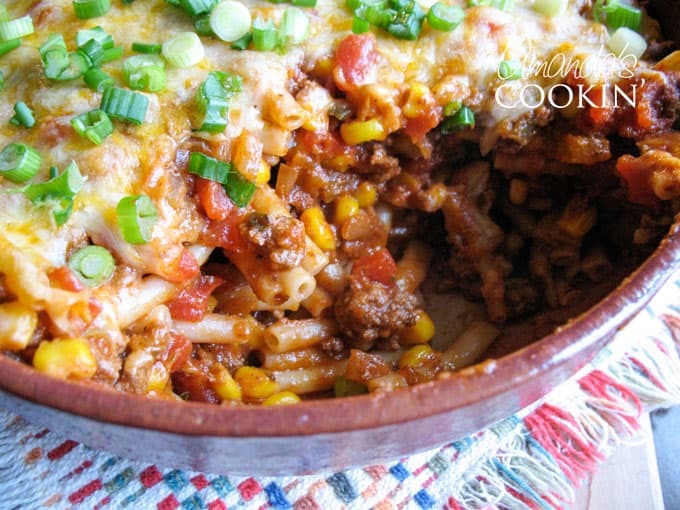 While we love hamburgers, tacos, and shepherd’s pie, there’s only so many times you want to serve those each month, so this ground beef casserole was a welcome addition to our rotation. When my kids were younger, getting them to try new things was often like pulling teeth. I knew I was in for the “what’s that” type questions. I always tried to be very generic in my answers, the less details the better. So I called this “southwest casserole” which is quite generic and doesn’t reveal anything in the ingredient agenda. It was different than hamburger casserole I had grown up with for sure! The first time I made this years ago I used a quick cooking pasta, which I don’t recommend. Use regular pasta as indicated in the recipe. The quick cooking type cooks too long in this dish and tends to get a bit mushy. 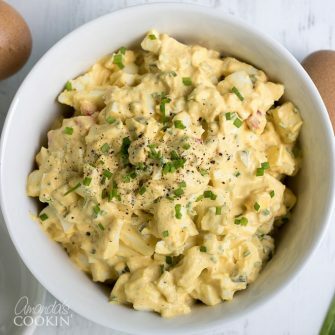 You could certainly use a no-boil pasta in this casserole, I would suggest soaking them in hot water while you are prepping the recipe on the stove. 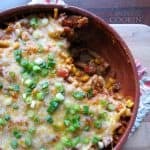 This ground beef casserole is great as leftovers so it doesn’t hurt to make it for a smaller family or just two people! I’ve made it several times and enjoyed the leftovers for lunch or another dinner. You can scoop out the finished recipe into individual serving containers, great for taking to work. Can I freeze this casserole and bake it later? Prepare the casserole according to the instructions in the printable version below – do not add the onions to the top as they are for garnish when you serve it. Cool the dish completely after cooking. Wrap tightly in plastic wrap to avoid freezer burn. Wrap in foil then label and date it. When ready to bake, preheat oven to 375 F and remove foil so you can take off the plastic wrap from frozen dish. Put the foil back on and bake (casserole will still be frozen) for about an hour. Check for doneness, continue for another 15 minutes if needed. If you defrosted the casserole, reheat for 35-45 minutes. Tip: If you don’t want your baking pan in the freezer for three months, after the dish has cooled completely line another baking dish with 2-3 layers of plastic wrap leaving extra hanging over the sides. Place the cooled casserole into the lined pan and freeze. Once frozen lift the dish out with the plastic wrap. Remove the plastic wrap and transfer the frozen item to a freezer safe bag. When you’re ready to bake it, simply remove from the bag and place it into a baking dish. You can use ground beef, ground turkey or even ground chicken, depending on your flavor preferences. Other ground meats can be substituted as well such as venison or bison, making this a very versatile recipe. Ground Italian sausage mixed with ground beef or turkey would be a great flavor combination too! I mention something called Magic Dust in the recipe below. This is a mixture I keep in my kitchen that I found in the book Peace, Love & Barbecue. I prefer it and I’ve provided it in the recipe below, but you can use a steak seasoning instead. While I have listed Red Gold diced tomatoes, you don’t have to use that brand. The key was that they have green chiles already added. If you can’t find them, you can use a regular can of tomatoes and add a 4-ounce can of green chiles. You can find a Mexican cheese blend already shredded at the grocery store. However if you have a preference on cheese feel free to use whatever you like. I do recommend that you have a cheddar cheese and a jack cheese in the mix. The casserole dish you see pictured in these photos was something I found at a thrift store. It’s handmade pottery with a certain rustic charm. You can use a 9×9 square baking pan or a 2-quart casserole. Make sure you use a large skillet. You’ll be browning the ground meat, but then you will add several ingredients and need room to stir. You’ll also need a cutting board, a chef’s knife for chopping your vegetables, your favorite spoon for stirring everything and of course some measuring cups and spoons. 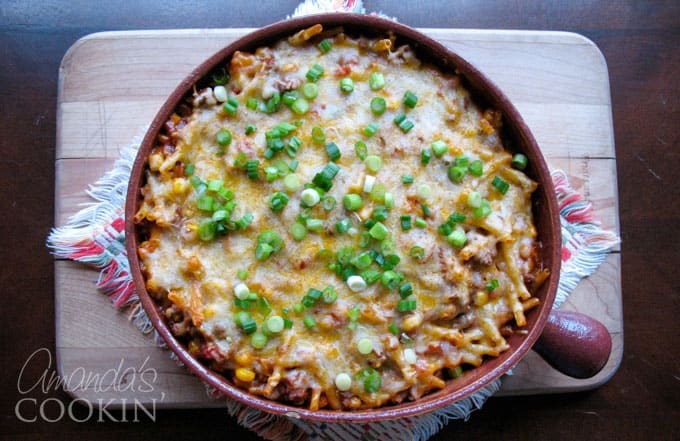 John Wayne Casserole – This delicious casserole uses canned biscuits for the crust which is topped with taco seasoned ground beef, a creamy cheese mixture, and peppers and tomatoes. Taco Empanadas – Making these simple meat-filled pockets is a fun thing for the kids to help with, and they are great for taking along to football and soccer games! The Best Meatloaf Recipe Ever – I have the say, this is the best meatloaf I’ve ever had and don’t make any other kind now! Spaghetti Pie – Cooked spaghetti noodles, ground beef, sauce, and cheese all baked in a pie plate. Shepherd’s Pie – Another one of my favorite recipes, this Shepherd’s Pie is a far cry from the hamburger pie I grew up with. Salisbury Steaks – If you ate EnCor Salisbury steaks when you were young, this homemade version is going to be your new favorite! A lot of bargains in here! Some are free as a Kindle version and others are only a dollar or two. We love hamburgers, tacos, and chili, but new ground beef recipes are always welcome in my kitchen. 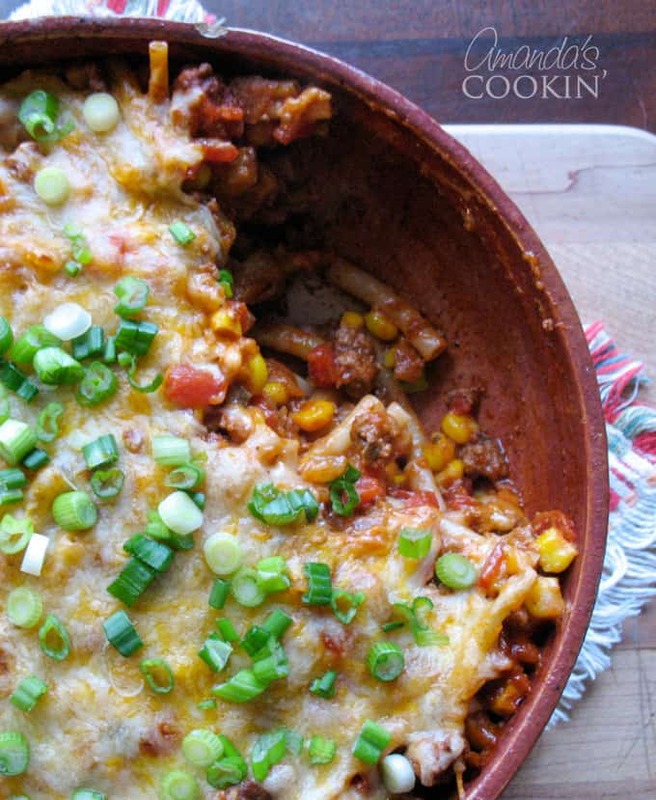 This southwest ground beef casserole is a favorite! Preheat oven to 325 degrees. Spray a two-quart casserole dish with cooking spray. In large skillet brown ground beef with onions, bell pepper and red pepper flakes. Season with Magic Dust or steak seasoning. Add the tomato sauce, diced tomatoes, oregano and chili powder and bring to a gentle boil. Reduce heat and simmer for 15-20 minutes. Add the frozen corn and simmer for a few more minutes. Remove from heat and stir in the 2 ounces of cheese until melted. Gently stir in the cooked pasta. Pour everything into prepared casserole dish and top with shredded cheese. Bake uncovered for 20-30 minutes, or until browned and bubbly. Mix everything together and store in an airtight container. Keep some on a shaker bottle for the grill! Hi Katie! So glad he enjoyed it, and the crumbled chips on top sound great! Made this tonight for dinner and it was delicious! We all loved it, even my meat hating 2 year old and my veggie hating 1 year old. They both scarfed it down and asked for more! This will be made many more times for us. I love how it can be tweaked so easily too. I added extra green chilies and I think next time I’ll add extra veggies. Just made this tonight. Fabulous. Thanks for a great recipe. Thanks Charline, so glad you enjoyed it! This sounds great! I want to try it tonight! One question, Amanda… Do you drain the grease from the meat before adding the other ingredients? Very good!! I used venison instead of the ground beef. My family has put this recipe on the “keeper” list! Glad you enjoyed it Nancy, love the venison substitution! Is the pasta supposed to be cooked or uncooked? This looks fantastic! Thanks for sharing such a wonderful dish. I loved it so much that I featured it on my blog in a recipe round-up. 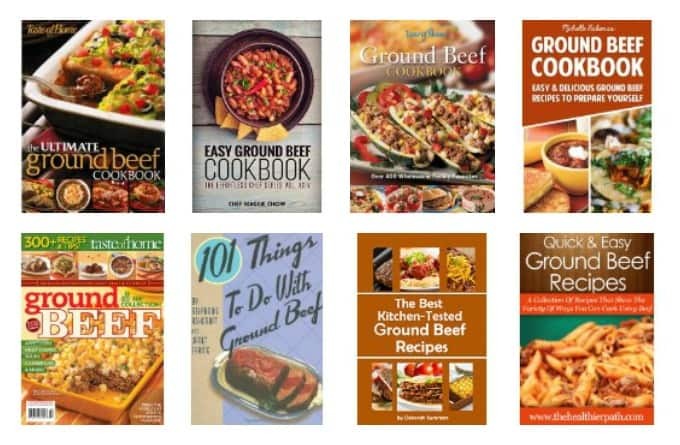 You can check it out at http://www.recipelionblog.com/quick-easy-top-5-ground-beef-recipes/. Thanks, again. I know what I’m making for dinner tonight. 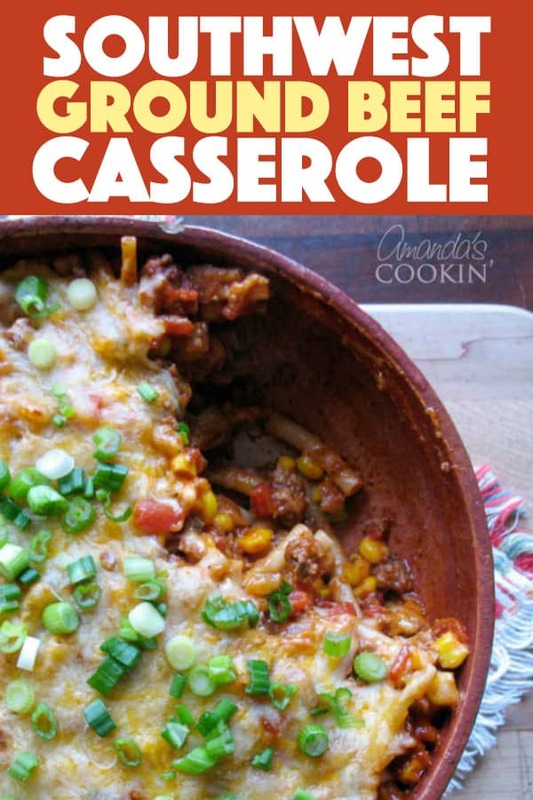 I seldom make casseroles now that my youngest child has flown the coop…and now I'm wondering why? Love the southwest touch; what I use to avoid as a young adult is now so necessary…heat! Made this tonight… sorta. I left out the diced tomatoes and chiles, and threw in a can of black beans and taco seasoning. It was really good! My husband, who rarely says anything about a meal, commented on how good it was.